Sometime back I’ve written a tutorial on Hello World Spring MVC. Spring MVC web is a model-view-control framework and you can find more information here. In spring mvc where to put css/js/img files? Why my project can’t find css, images and js static files, etc? In this tutorial we will go over all detailed steps on how to include both into your Spring MVC java project simplest way. Below is an updated project structure for your reference. Please go ahead and implement your HelloWorld Spring MVC project by following all detailed steps. Make sure you have it working correctly. Now, in below steps we are going to – create 1 folder, add 2 files, modify 2 files. 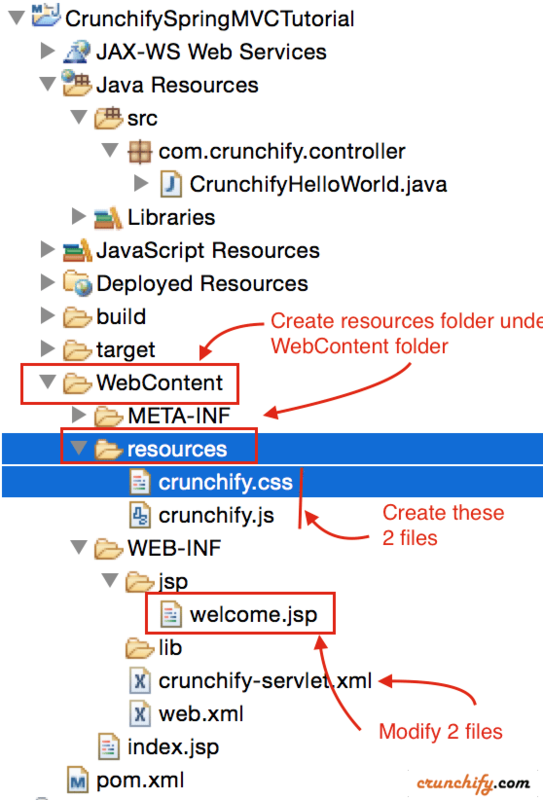 Create resources folder under WebContent folder. Create crunchify.js file under resources folder. Create crunchify.css file under resources folder. Modify welcome.jsp file with below content. Please checkout highlighted lines. <br> Spring MCV Tutorial by <a href="https://crunchify.com">Crunchify</a>. Here spring:url tag based on the JSTL c:url tag. This variant is fully backwards compatible with the standard tag. Enhancements include support for URL template parameters. Modify crunchify-servlet.xml file. Add below two lines at the bottom of file before </beans> tag. mvc:resources configures a handler for serving static resources such as images, js, and, css files with cache headers optimized for efficient loading in a web browser. Allows resources to be served out of any path that is reachable via Spring’s Resource handling. How to Read config.properties value using Spring MVC ‘singleton’ Scope in Java?